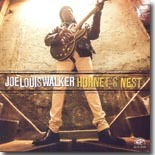 Joe Louis Walker consistently puts out quality CDs that always rank highly with our reviewers. His new one on Alligator, Hornet's Nest, is our Pick Hit for the month. Two of our reviewers raved about Jim Suhler's new disc, Panther Burn, making it the logical choice for this month's Surprise pick. This month's Flashback features a look back at the wonderful Heart of Gold from Austin legend W.C. Clark. Our What's New section features reviews of new CDs from Damon Fowler, Kim Simmonds & Savoy Brown, Mickey Thomas & The Bluesmasters, Adrianna Marie, Annie Mack, John Del Toro Richardson & Sean Carney, Jason Vivone and the Billy Bats, Mary Bridget Davies' tribute to Janis Joplin, and more.